So, steampunk is not something I know a lot about. I tried to get through William Gibson’s Difference Engine and around page thirty I decided life was too short. Despite my inability to get through any modern version of the genre, I do enjoy the old scientific romances such as Time Machine and Tono-Bungay which is not a scientific romance, but I have been reading and enjoying at the recommendation of a friend. Though lesser known then others of Well’s novels, I’m enjoying it as much as I did Time Machine. 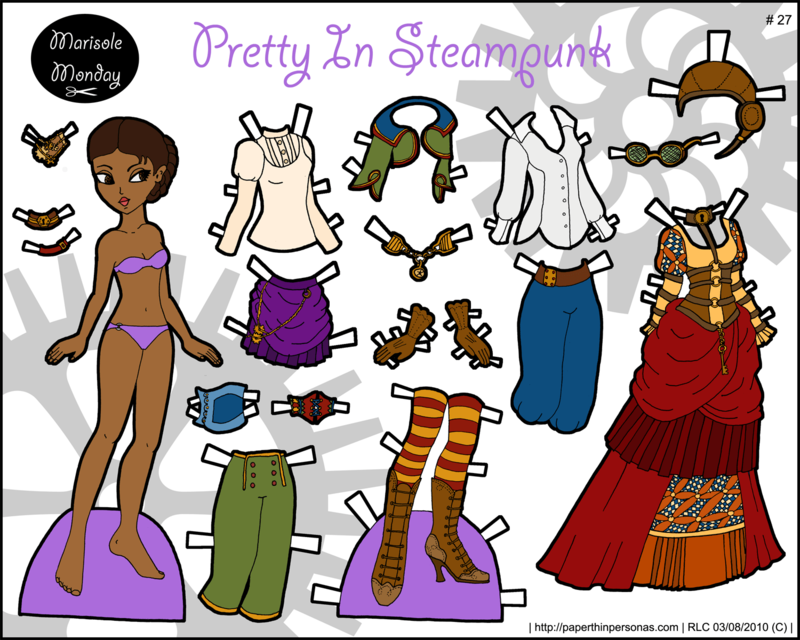 Anyway, this paper doll post is dedicated to a few friends who are very into Steampunk and without this flicker group, it just wouldn’t have happened. Thank goodness for that. Of course, knowing a fair bit about Victorian costume, it was hard to not want to draw everything to be actually period and that’s not the point. I did my best, but expect another post like this whenever I feel inspired again. Oh, and you might want to cut along the sleeves of the blouses next to the dolls body to make it easier to layer her clothing with this set. The more I draw for Marisole, the more her arm placement annoys me. A perfect paper doll pose is such an impossible goal. I’m glad it makes you happy. I thought it would. AAAHHHHH!!! THEY ARE SO AWESOME!! Ok, I love it!!! they are totally cool/awesome/hip/grand/splendid/inspiring/whatever-you-want-to-call-it!! It reminds me of gypsy kinda stuff. That stuff always catches my eye!! this is fabulous! the shoes are just to die for! Thank you all so much. I had fun drawing and coloring these and I’m glad everyone seems to like them as much as I did. I absolutely love all of your dolls! MY kids and nieces do as well!! Any chance of this one in black and white? My oldest (9 year old girl) is very into steampunk right now!